“National Opposites Day is a day that will live in infamy, and I’m the first president to say that,” said Trump. 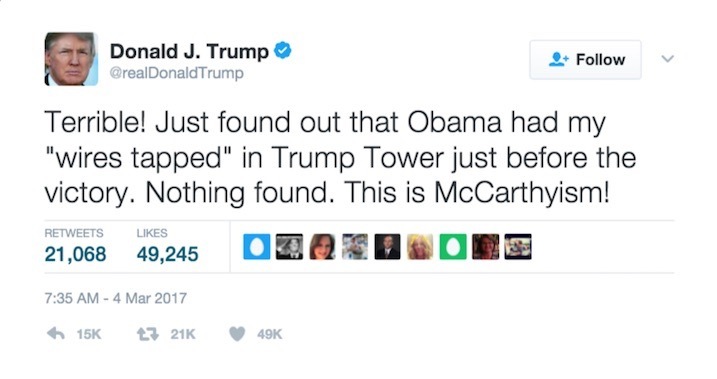 In a desperate attempt to move beyond the accusations made by the White House that former President Barack Obama had wiretap surveillance installed at Trump Tower, Donald Trump has retroactively declared March 4th to be National Opposites Day. The Tweet that started the storm surge of suggested espionage was published at 6:35 A.M. on… you guess it, March the 4th. Scholars of the English language are siting the move as the literary equivalent to the horror movie, The Purge, where Americans have a twenty-four hour window to commit unspeakable acts of violence without the risk of persecution or punishment. “He’s done more to harm the English language in a few months than George W. did in eight years,” claims Dr. Miriam Fogel, Professor of English Literature at Georgetown University. “When that man speaks, brain cells everywhere evaporate faster than climate change,” she continued. 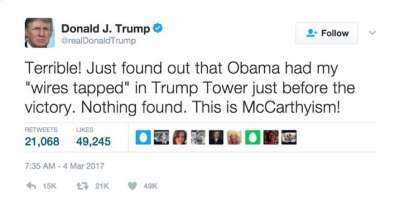 Since the tweet’s publication Donald Trump and his staff have been bombarded with requests for proof of the alleged surveillance. White House Press Secretary, Sean Spicer, feels that Donald Trump’s use of air quote exonerates the specificity of any direct accusation made by the President. Spicer then went on to elaborate as to the President’s initial reaction in regards to addressing the media. Spicer claims that The White House and its staff are working tirelessly and that evidence of the alleged surveillance will soon be produced for congressional evaluation.